The Department of Defense policies and procedures implementing and supplementing the Federal Acquisition Regulation (FAR) are reproduced in this essential resource. 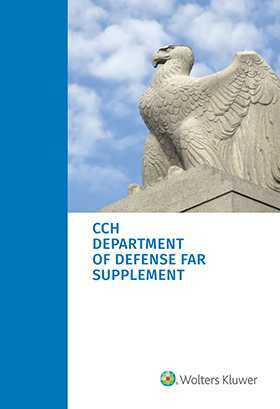 The January 2019 Department of Defense FAR Supplement (DFARS) includes the full text of the DFARS and DFARS Procedure Guidance Information (DFARS PGI). You gain at-your-fingertips access to DFARS regulations and related guidance, including all interim rules, final rules and Change Notices issued prior to January 1, 2019, along with an easy-to-use topical index. The gold-standard for department of defense regulations, DFARS requirements, federal procurement guidelines, government contract guidelines, and more, this is the one resource that gives you what you need to maintain DFARS compliance. The regulations and guidance contained in this reference apply to contracting with the Office of the Secretary of Defense, the Departments of the Army, Navy and Air Force, the Defense Logistics Agency, and other defense agencies. How do I contract with the Department of Defense? How do I ensure that I’m compliant with Department of Defense contracting regulations? What are the special categories of contracting with the Department of Defense? What are the general requirements for contracting with the Department of Defense? What are Department of Defense Socioeconomic Programs?